Long before decisions are made about whether floor coverings will be hardwood, laminate, vinyl, tile, or carpeting, the structure must be built properly to avoid squeaks. In older homes, squeaky floors don't surprise anyone. But in newer homes, floor squeaks are almost always a symptom of improper design, poor installation, or the improper use of materials. If you thought squeaking was unavoidable, think again. To learn more about how National Lumber can help with your next project, call 1-800-370-WOOD. MiTek USP Structural Connectors photo showing Shear Nails Missing. The hanger has no double shear nails, so it offers a reduced downward load and no uplift resistance at all. With the ever increasing use of engineered wood products (EWP) such as engineered I-Joists, Laminated Veneer Lumber and OSB sub-floor sheathing, the amount of floor squeak complaints have reduced. However, issues can still arise on the installation side of the equation or with the use of solid sawn lumber. Care must be taken to ensure that every component is installed as prescribed by the engineer or the manufacturer. 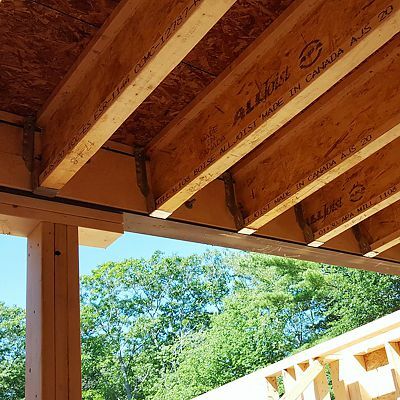 National Lumber recommends MiTek USP Structural Connectors, and they offer Job-Site Tips, including the Top 5 Hanger Installation Errors to Avoid. According to the American Plywood Association (APA), solid sawn lumber leaves the mill with a moisture content between sixteen and nineteen percent. 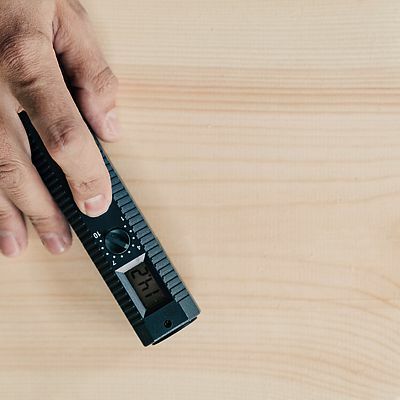 Four to eight months after installation, all components will reach equilibrium moisture content between six and ten percent, depending on location. That’s a difference of up to ten percent. Engineered Wood Products, at the time of manufacture, range between four and twelve percent. As you can see from the numbers, engineered wood products are more stable and less likely to shrink or swell, reducing squeaks. Mixing solid sawn lumber and engineered wood products is another area of concern. An engineered floor system should contain only engineered products, because of the difference in moisture contents. An often overlooked issue is the subfloor adhesive. Often, the manufacturer’s directions are not or cannot be followed due to time and weather constraints on the job. Some framers have been known to warm the tubes of adhesive on their engine block and install the adhesive on frozen lumber in the winter. During wet weather, some framers have been known to apply adhesive on wet framing members and it does not adhere properly. Other times, material is wasted by cutting the applicator tube too big, or not enough material is used by cutting the applicator tube too small. Sometimes, adhesive is not applied at all for whatever reason. National Lumber has the solution — superior pre-applied subfloor adhesive. 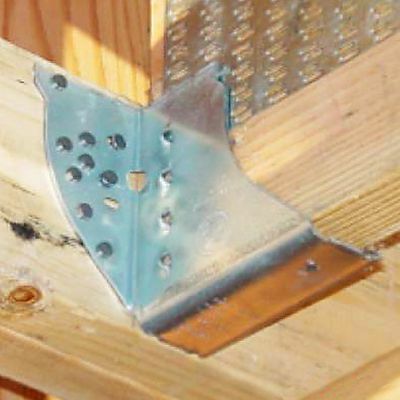 National Lumber's pre-applied adhesive on I-Joist. With the protective plastic strip removed it is now ready for subfloor material to be installed. A solution for adhesive issues is being championed by National Lumber. We now pre-apply subfloor adhesive to our engineered wood products at our facility in Mansfield, MA. There are no more substandard or missing subfloor adhesive problems with this system. 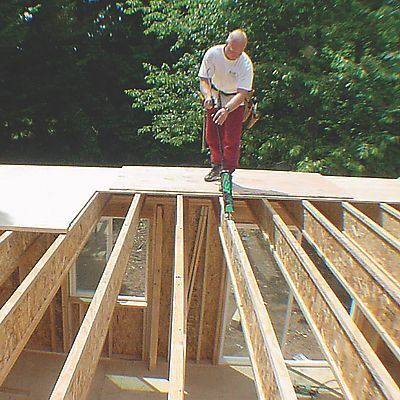 At the job site, the framer will install the I-Joists according to the supplied layout in their usual manner. 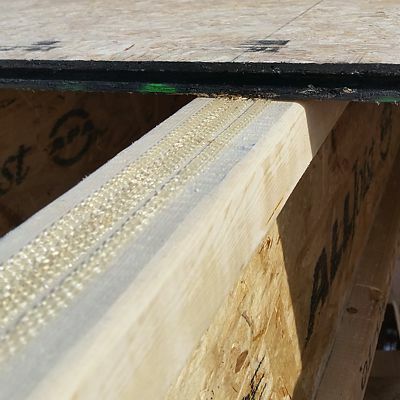 When the time arrives to install the subfloor sheathing, the framer simply needs to remove the protective plastic strip, lay down the sheathing, and nail. The adhesive has a 24-hour cure time and stays flexible after curing, unlike most subfloor adhesives that harden like concrete. The flexibility allows the framing members and sheathing to expand and contract naturally without fear of breaking the adhesive bond and causing a squeak.